Gender: Men’s Dial Color: Black Case: Stainless Steel PVD 48mm x 58mm Strap: Rubber Bezel: 18k Rose Gold Crystal: Scratch Resistant Sapphire Movement: Quartz Water Resistant: 30 meters / 100 feet Additional Information: Brand new HD3 Slyde gent’s watch, Model # PV4N00 V1 ALF01. Stainless steel PVD 47.71mm x 57.84mm case. 18k rose gold bezel. Black colored dial. Stainless steel lugs. Quartz movement, 3.8V lithium polymer, capacity of 250 mAh. Rubber strap with stainless steel PVD deploy buckle. Water resistant up to 30 meters / 100 feet. 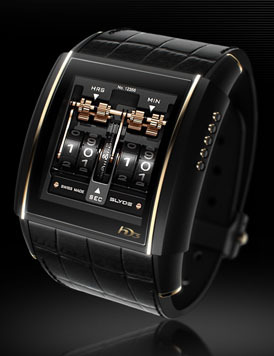 Displays seven functions: the time, the date, time zones, a calendar, the moon phase, a chronograph and a countdown timer. Screen TFT 232x240 pixel, 28 x 29mm active zone. Case back USB socket connector (for charging the battery or communicating with PCs or MACs). Slyde’s patented bi-axial navigation system shows every form of time: On the vertical axis, present time offers a variety of watch interfaces for a customized indication of the current time. By tapping or sliding a finger on the screen the wearer selects a display from the range of modules, scrolling from an animated virtual mechanism in 3D to a digital module that can be entirely configured to personal preferences. On the horizontal axis, past and future time can be fully personalized by activating the time elapsed since an occasion or the countdown of time remaining until an event (using personal pictures and integrated indicators). There are no buttons on the watch, just three battery indicator lights on the side and a light sensor to automatically adapt the brightness of the screen. Everything will be controlled with taps or slides on the touchscreen. Of course, the name "Slyde" comes from the idea that you slide your fingers over the dial. SLYDE takes the underlying principle of the smartphone – the possibility to change applications by merely sliding a finger over a tactile screen – and adapts it to the world of 21st century watchmaking. Есть вопросы по HD3 PV4N00 V1 ALF01 Slyde ?